The Regency Park Book Club's next meeting will be held on Tuesday, March 9th at 2:00 pm. 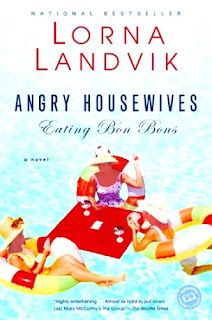 The book selection this month is Angry Housewives Eating Bon Bons by Lorna Landvik. The book tells the story of five friends over three decades. The women meet in Freesia Court, Minn in 1968 and become fast friends. Over the years, they face happy times and challenges together as their personal dramas are punctuated by historical political milestones such as the Vietnam War, Martin Luther King, Jr., and the assassination of Pres. Kennedy. Copies of the book are available at the Check Out desk in the library. Just ask for this month's book club book!